Two weekends ago my entire Aussie family spent three days of opulent bliss up in the Hunter Valley to celebrate the wedding of my Sydney-based uncle. The bride and groom put all of us up, from both extended families - booking out every room at the insanely luxurious Tower Lodge. As well as being the location of our accommodation, Tower Lodge doubled as the venue for the twilight wedding ceremony and the reception. It looked sublime. 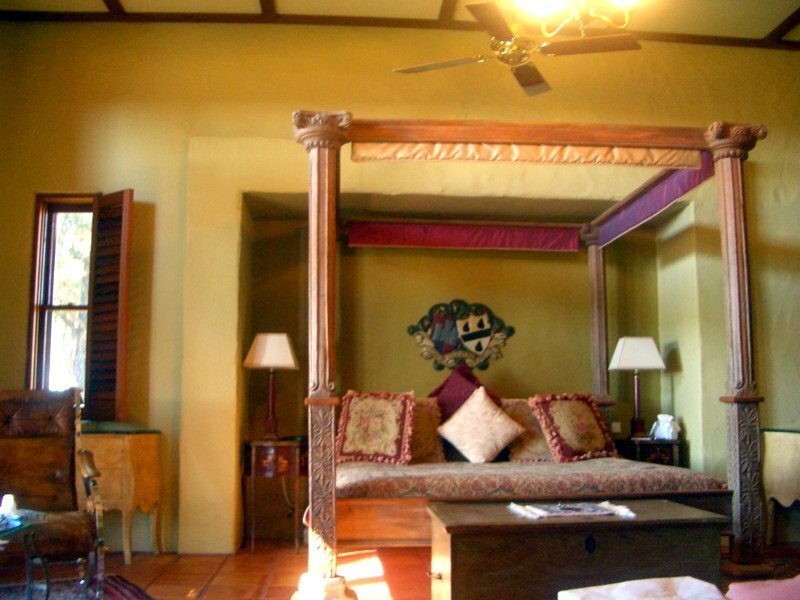 Each of the rooms had a different theme. Birdie and I were in what I dubbed the Tally Ho Pip Pip Hunting Room - I got quite a fright one morning to wake up and find that green marble stag (or is it an elk?) looming directly over me! Clockise, from top left: Mum and Dad were in the Oriental Room, which was full of gorgeous antiques; the bride and groom were married in the central courtyard; the Bridal Suite featured a 300-year-old hand carved Rajasthani bed; we had breakfast each morning in the Blue Room. 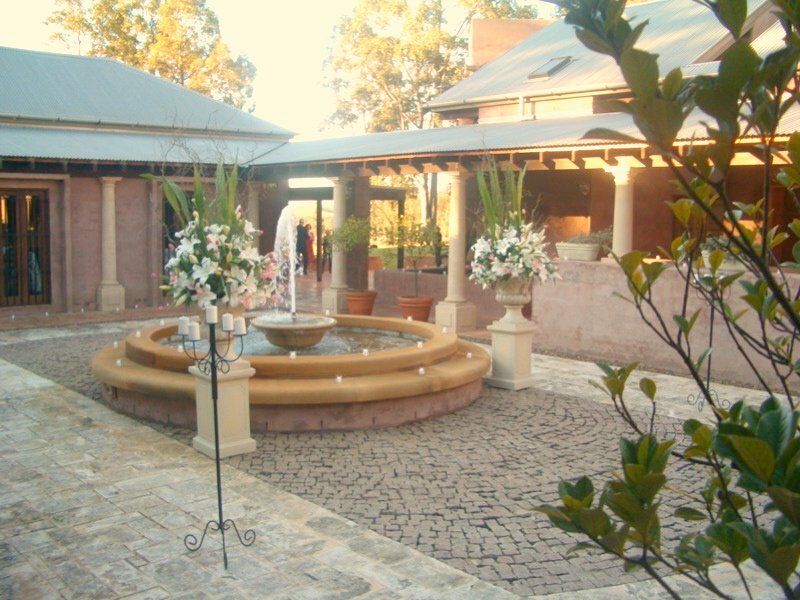 On the Friday night the bride's parents very generously shouted all sixty wedding guests a lavish dinner at Roberts, the nearby restaurant where we dined last time I came to the Hunter Valley. When the groom's party reaches the wedding venue, milni ceremony is performed. The bride's close relatives give a warm welcome to the groom and his relatives with flower garlands. Rose water is sprinkled on them. In the milni ceremony, the girl's relatives give a welcome to the groom's close relatives. It is done in the descending order, beginning from the elder most. Cash and clothes are gifted." Obviously ours was modified, was still a fun intro though I think. In true cross-cultural tradition, India met Scotland. Whilst my mother's family is Italian my dad's side of the family is originally Scottish, and the groom donned a kilt for the wedding ceremony - so did Dad and uncle J! The wedding kilt is partially visible there on the left. And now to the food! I'm afraid I was having too much fun to properly analyse what we ate, but both the Roberts dinner and the wedding reception were excellent. On the Friday night one of the hors d'oeuvres was gravlax with juicy balls of salmon roe, and at the reception I yummed up a few of these puff pastry beauties containing very fresh kingfish. 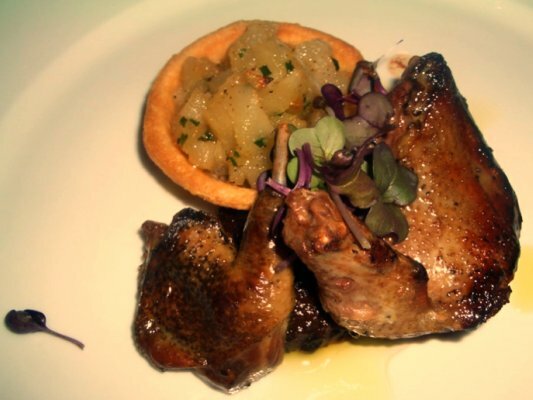 A selection of the dishes (clockwise, from top left): ballotine of wood-smoked local quail with lightly poached pear, gorgonzola and radish shoots; fresh fettuccine with king brown mushrooms, sage leaves and garlic butter; marinated wood pigeon breast served pink, confit leg, sticky prune paste and baked pear tart; and grilled loin of Western Australian lamb with baby fennel, baked eggplant and chilli salsa. Looks glorious. Glad you enjoyed yourself. How gorgeous! What a wonderful way to spend a weekend. Congrats to your uncle! Anyone else in your extended family need a spouse? Could I keep my old one as well? I am having trouble writing this from my position, on the floor, of death by envy. Lucky you!! And I adore that photo where the bridal party are gambolling in the late afternoon light with the magnificent and beautiful aussie setting. Hi Lucy, yeah the stag really did seem rather OTT... but we did have fun! Thanks Agnes! We're all super happy for my uncle and his bride. Oh Cathy! Hope you resume normal standing position before our Saturday performance... thanks for the comment, and bonus points for the excellent use of "gambolling"! Wow, wish I was in your family! How glamorous. I was in Hunter Valley too, a couple of weeks back, but didn't get to check out Tower Lodge. Wanted to stay there tho, maybe next time!